Bufkin’s job can run the gambit from her maintaining the Philosophy bulletin boards , including the boards that depict current majors and ask philosophical questions, that are in the Christian Center, to helping professors with research, to printing for the department, to helping professors as they prepare to move out of the Christian Center. “We typically have one student worker for the philosophy department, and all of us utilize that student worker to the extent that we want to,” Dr. Kristen Golden, chair of the philosophy department, said. “I just try to keep the Philosophy Department’s image good on campus, so that we are present. Part of my job is making sure that people know that we are a department and we have professors and we are open to new majors,” Bufkin said. “I get the sense from my colleagues across arts and letters that (student workers) are definitely essential. There are a lot of various daily tasks (that student workers complete,” Golden said. Golden says that she knows of student workers who keep professors updated on what is in their mailboxes, who carry texts to and from the library, who help with Xeroxing, and who help with word processing. “One of the greatest things Merrilee helped me with last spring (was when) I needed a document typed from a book into a word document that I could edit. That was a big project that took her a couple of weeks,” Golden said. Bufkin became the philosophy department’s student worker as a sophomore, after the student who previously held that position graduated. This year, Bufkin has faced a few hurdles with her job, though they haven’t been because of the department. “I got (approved for) this job really late because of the business office changes,” Bufkin said. She says that understanding the paperwork required for the job and to whom the paperwork needed to be given took approximately four weeks. “(Merrilee) probably lost eight weeks of pay… because I don’t think she can earn that back,” Golden said. “We didn’t have her officially hired, so it didn’t make sense for her to log in hours and that, to me, is the most egregious part of all of this.” Golden says that, at the end of the summer, Bufkin helped her organize her move from the Christian Center to Sullivan-Harrell with the understanding that she would log-in hours and be paid when the semester started. Rachel Long, a senior English major, works as a residence hall director, at the front desk of the library, in the records office and with the printing press in the English House. 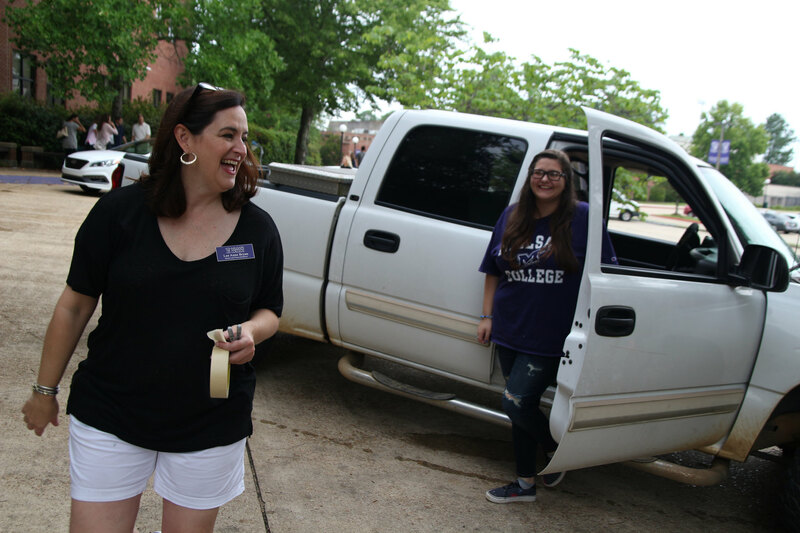 During her freshman year, Long needed on-campus jobs to afford to stay at Millsaps . With the help of people on-campus, Long found jobs in the library and the records office. In total, Long has worked in the records office and the library for four years, as an RA since January of 2015, and she began work with the printing press this semester. Long is being paid, but she says she was not able to work in the Records Office until mid-September, though she began her jobs as a resident assistant and in the library right away. “I couldn’t start work in the records office until [about a month] into school, and the same with the printing job… I understand the wait [to begin working] with the printing job, because that was new,” Long said. Though some students and administrators in departments on campus have reported lack of pay, Long personally has not experienced this. Andrew Thaw, associate professor of psychology and neuroscience, has worked at Millsaps for nearly nineteen years. “(I have used student workers and student researchers) pretty much every year,” Thaw said. Thaw uses student researchers to work directly with him on projects or on their independent research projects. He requested two student researchers and managed to get them approved. Student researchers work as part of a directed research project or in addition to other activities they’re doing, thus, they are not classified as student workers. Though student researchers have not been affected, Thaw says that the new job process has affected student workers. “We have had some growing pains… we do hire students to work in our department, they have jobs like working with internships and we really need the man power for that,” Thaw said. Like in other departments, in previous years, if he wanted to hire a student worker, he could do so at his discretion. This year, there has been a delay, due to the longer process. “Sometimes we get started later than I wish we would, with the new way of doing things,” Thaw said. In a previous interview with The Purple and White, Dan Hungerford, Vice President for Finance, said that the changes to the job processing system were necessary due to disorganization in previous years. “One of the things the college never had was a clear picture about how many college jobs we really had, who was working those jobs, what rates of pay we were paying them and when the start and end times (of the jobs) were,” Hungerford said. Additionally, Hungerford said that they new job process was needed in order to make Millsaps complaint with federal guidelines. In previous years, students and professors agreed about on-campus jobs, allowing students to be hired on the spot. Now, the potential employer must put the job on the College Central Network, which includes a job description and a budget. Once the job is added to the College Central Network, students can log on to the site, see which jobs are available and apply for the job. Once the student applies for the job, if they are accepted, they must complete a W-4 form, an I-9 form, a Millsaps Electronic Deposit form, a Mississippi State Withholding Exemption Certificate and give the Human Resources Department two different forms of identification. For more about the Business Office and its changes this year, read our story Business Office Changes and their Consequences (https://millsapspandw.wordpress.com/2016/09/22/business-office-changes-and-their-consequences/).